1. BaubleBar Solo Pendant I love a solitaire diamond or crystal necklace but hate the price tag on most of them. This one is simple and budget friendly. Can you ever go wrong with BaubleBar? 2. Kate Spade A Satchel Kate Spade has been consistently turning out bags with sleek and chic styles, and this is another perfect example of one. 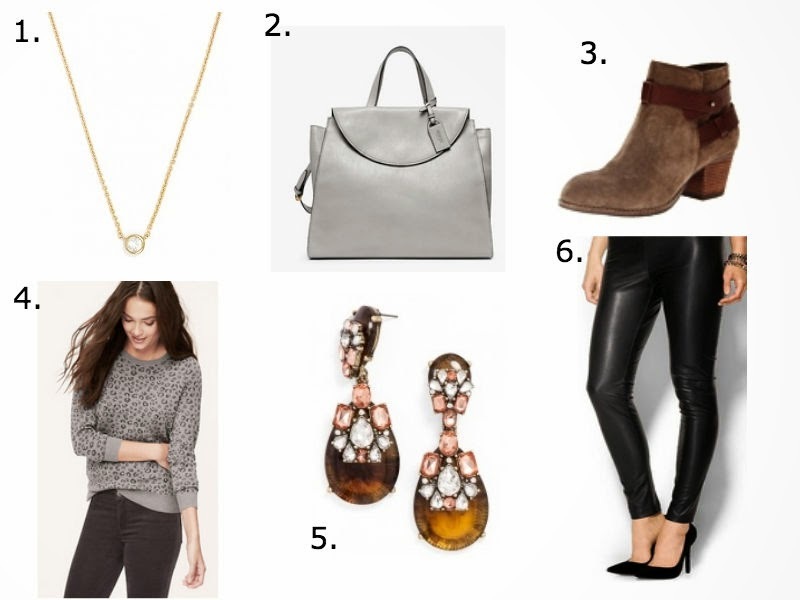 The grey color is a great neutral to pair with rich fall colors. 3. DV by Dolce Vita Vaxen Bootie These are so similar to the Rag and Bone pair I posted about last week (Shelby add these to the list!) I literally did a double take! I need to check them out in real life to make sure they're not a total Monet. 4. Loft Sweater I. Love. Animal. Prints. Probably too much. I literally bought a cheetah top yesterday while mentally searching for this sweater. Someone stop me, just not quite yet! 5. Pink Lady Tortoise Drops What would a Tuesday Shopaholic be without some divine drops? 6. Piperlime Faux Leather Leggings A good pair of faux leather leggings is hard to find and these look pretty good. I love how they don't appear to be too snug and give the illusion of more of a pant as opposed to a legging. Don't nobody want to be dealing with too tight leather. Love. It. All!!! So bummed that necklace is sold out - it's gorge! Those leather pants! I found a pair at Forever 21 last week that I can't stop thinking about... I think I need to go back and get them! Seriously loving those booties and that leopard sweater! I love animal prints too! Oh and don't even get me started on those leather leggings!! Why did you have to show me that perfect grey bag?! Absolutely love it!! You found the R&B twin! Go you!! Love them! So want some (not-too-tight) faux leather leggings too. Nice finds! So many good pieces! I'm a big fan of Dolce Vita shoes and need to check those out! I have a serious obsession/problem with taupe and grey bags......they just go with everything right? Let me know if you order those leggings I am definitely intrigued! Those leggings and that bag! Love! Great finds per the usual!